Readable Feast cofounders Louisa Kasdon (left) and Annie B. Copps. Boston has plenty of book festivals, but the Readable Feast is something new. Cofounded by Annie B. Copps and Louisa Kasdon, this is a festival to celebrate cookbooks and the people who write them. The inaugural event takes place June 17 and 18 at the Boston Public Market. “This will really make cookbooks 3-D for the public,” said Copps. The Readable Feast brings together New England cookbook authors, food writers, editors, chefs, and the public for two days of demonstrations, seminars, and book signings. An awards ceremony recognizes the best cookbooks by New England authors or about New England food published between the spring of 2015 and the spring of 2016. Copps and Kasdon both write about food. Kasdon is founder of Let’s Talk About Food, a Boston-based organization that encourages literacy and education around the subject, and Copps is a senior editor at Yankee Magazine who oversees food coverage. The two came together in January and began scheming. Since then, Kasdon said, her house in Cambridge has been turned into a “depot” for meeting, planning, organizing, budgeting, and decision making — on every detail down to the type of plates they’re using. 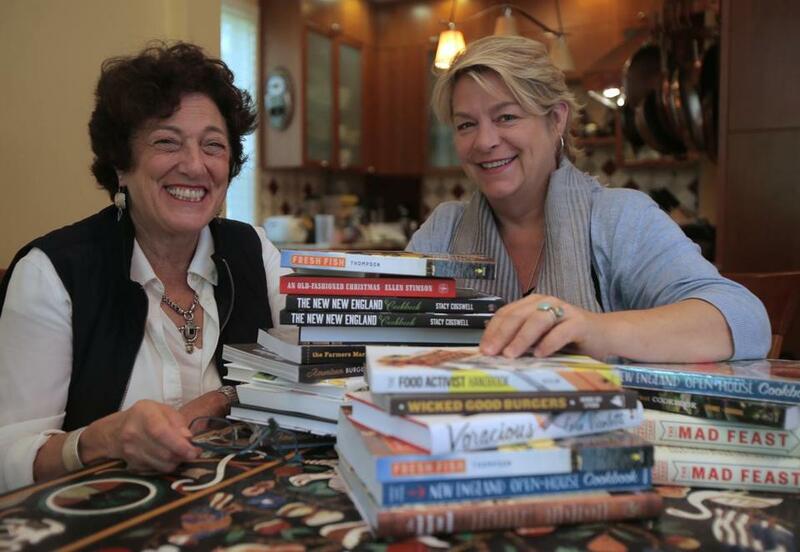 “I’ve spent a lot of the last few months ferrying cookbooks around to judges,” Kasdon said. The event is divided into two parts. Friday night is the awards ceremony for cookbook authors, in seven different categories (including a People’s Choice award decided by an online vote). The winner of cookbook of the year is “The Food Lab,” by J. Kenji López-Alt. Other awards will go to “Two If by Sea,” by Barton Seaver; “Pig Tales,”by Barry Estabrook (in two categories); “Food Gift Love,” by Maggie Battista; and “American Wine: A Coming of Age Story,” by Tom Acitelli. This event will also include two special awards — a lifetime achievement award for chef and cookbook author Jasper White, and a “Local Hero” award for food activist and author Frances Moore Lappé. It takes place at the Kitchen at the Boston Public Market, and includes food prepared by local chefs and authors. Tickets are $50. June 18, from 10 a.m.-5 p.m., there will be free cooking demonstrations at the Boston Public Market, book signings by cookbook authors, in-depth kitchen demonstrations and seminars for a $5 charge, and a plethora of market vendors hawking wares. Even in the age of Allrecipes.com, cookbooks still sell at surprising volume. In 2015, Nielsen Bookscan, which covers about 85 percent of the print book market, aggregated data that suggested almost 15.5 million print cookbooks sold in 2015. The Readable Feast is deeply focused on the local. To be included, books must be about New England culinary topics, or written by authors who are from New England or live here. And White noted that Boston has a particularly rich history of culinary writing. “Boston has the most amazing legacy, more than any other city in the country, in American cookbooks, beginning with Fannie Farmer,” White said, listing off esteemed local cookbook authors such as Julia Child. For more information, go to www.thereadablefeast.com. Sophie Haigney can be reached at sophie.haigney@globe.com. Follow her on Twitter at @SophieHaigney.